This is my Monday Mid-day Munchies post! I made this cauliflower salad with a chicken burger (bun-less) for lunch today! Hope this post helps take care of your Monday blues. Sometimes I really miss potato salad. A few years back, I found Everyday Paleo's 'No-tato Salad'. This is my version of a delicious and creamy cauliflower salad. It has yummy seasonings that will have you going back for seconds! 1. Add the chopped cauliflower to a large bowl and add two tablespoons of water. Cover with plastic wrap and microwave it for 4-6 minutes. Check it frequently towards the end of the cooking time because you want it tender but not mushy. (To speed the cooking of the cauliflower I microwave it, but if you have the time you can steam it for about 20 minutes). Drain the cauliflower and rinse it with cool water. 2. 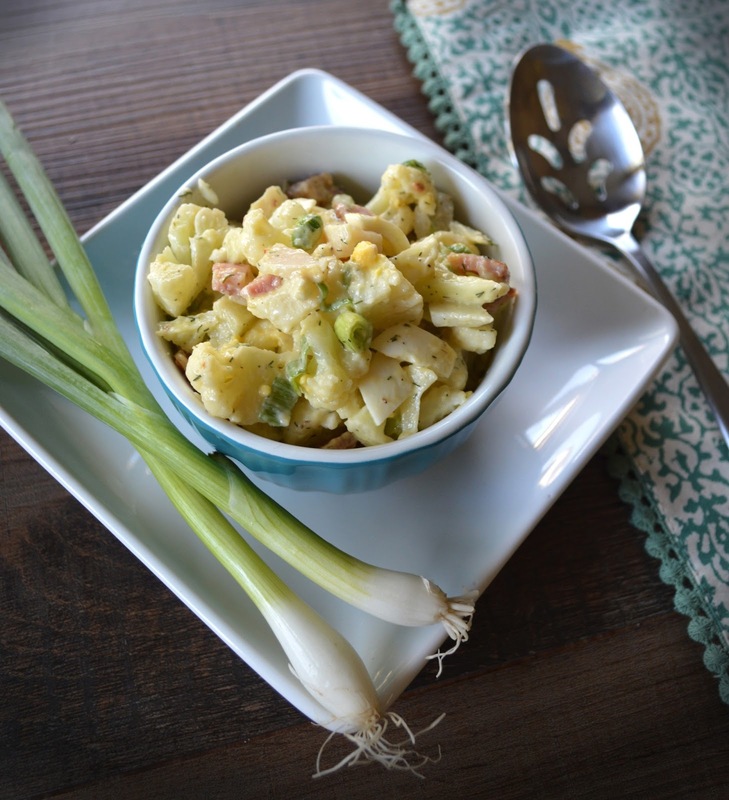 In a large bowl add the cauliflower, bacon, green onions, eggs, celery (or water chestnuts), mayonnaise, garlic powder, onion powder, dill, salt, and pepper. Toss the ingredients until they are completely combined. I made this today. My hubby that will not eat cauliflower, ate this! I will make again. Thanks for the recipe. You have very well researched on this topic.